In a corridor adjacent to the foyer of the Clarendon Laboratory at the University of Oxford in England, is an electric bell that has been ringing almost continuously since it was first displayed in 1840. The Oxford Electric Bell, also called the Clarendon Dry Pile, was an experimental electric bell when it was first set up. It consists of two brass half-spheres or bells, each positioned beneath a dry pile battery, with a metal sphere, about 4mm in diameter, suspended between the piles, acting as a ‘clapper’. The sphere moves the very short distance between the bells by electrostatic force. As the sphere touches one bell, it is charged by the pile, is electrostatically repelled, and is attracted to the other bell. On touching the other bell, the process repeats itself. Whilst a high voltage is required to create the motion, only a miniscule amount of charge is carried from one bell to the other, which is why the piles have been able to last since the apparatus was set up. It is not known for sure what the piles are made of – they may be Zamboni piles which are made of alternate layers of metal foil and paper coated with manganese dioxide – but they were coated with molten sulphur to insulate them and to reduce the effects of atmospheric moisture. The original Clarendon Laboratory in Oxford (photo taken in 1894) was the first purpose-built physics laboratory in the country. 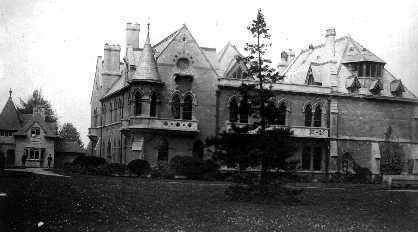 The building, much enlarged, is now incorporated into the Department of Earth Sciences. The bell was apparently made by Watkin and Hill, instrument makers, of London, and purchased by the Rev Robert Walker, Reader in Experimental Philosophy (the name by which physics was known at Oxford) at the university from 1839 to 1860, and Professor of Physics from 1860 to 1865. It bears a label in his handwriting ‘Set up in 1840’. The Oxford Electric Bell does not demonstrate perpetual motion as the bell will eventually stop when the dry piles are depleted of charge, if the clapper does not wear out first. It has now been ringing almost continuously for 175 years apart from occasional short interruptions caused by high humidity. 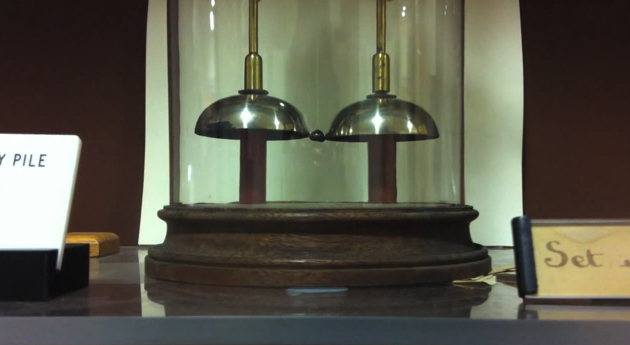 A double-thick glass bell jar muffles the ringing sound, so the bell is inaudible. There is a video of the bell here. 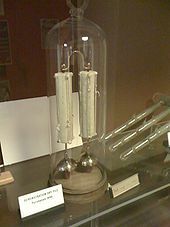 The bell has rung about 10 billion times and is considered to be the longest running experiment ever. The Guinness Book of Records lists it as the ‘world’s most durable battery’.